I'm working on a long CV which will include my entire art career/ education and art life. These Curriculum Vitae's or CV's are required when applying for certain types of funding or for academic teaching positions. I have never made such an extensive list of art-related media before. It has been quite interesting to 'Google' oneself and see what media is out there. I found a group of photos, now owned by Getty Images from the 2010 Olympic Coke Bottle Art that I was involved in. I had seen one of the images but had no idea these other images existed. Below are screen captures from the Getty Images site where they own the copyright. Nice studio, however it is currently filled with boxes. I am nearly 60 days beyond show opening for my INJUN-uity show and 2 weeks since moving boxes of belongings into a new house and new home studio. During the 2 months following my opening I was essentially homeless - going from one temporary residence to another, I wanted to continue with my art somehow, but it was impossible to focus without familiar tools and surroundings. Now in my new residence I feel overwhelmed by the task of setting up. Everywhere I look I see boxes. I am desperate for some help. I checked my favourite artist motivator Austin Kleon. His advice on keeping momentium is to 'chain smoke', that is let a new idea light up off the spark of the last one. This will only work if I have a work space set up, which I do not, so I need to look for something else. In my online search for an 'instant' solution I found a blog post by Jory MacKay, a Toronto-based writer and strategist. It seems that many of his articles deal with managing distractions and harnessing pockets of time for productivity. In an old article from 2015 on creative momentium he pulls together suggestions from others in the visual arts industry. The one that caught my eye was grouping similar tasks together. I think if I assign pockets of time to each task group I might be able to make this work for me. Do you have strategies for creating and maintaining momentum? Have you had to continue your art practice under unusual circumstances? Feel free to share in the comments. I am asked this question a lot and it is a difficult one to answer. I recently did some research into contemporary terms that are used to categorize artists. In this post, What kind of art do you make? , artist and professor Daric Gill defines the differences between artists having one discipline, like painting, drawing or sculpture, or practicing in a Multidisciplinary, Interdisciplinary or Transdisciplinary way. He says "every time you see the suffix 'disciplinary', switch it for 'ways of thinking'." Therefore, "Multidisciplinary = Multi-ways of thinking, Interdisciplinary = mutual ways of thinking, and Transdisciplinary = transcends ways of thinking". So using these analogies, my art practice can be seen as an extension of my world view, then I guess it would be no surprise if I considered my art practice to be Interdisciplinary. It could also be called Metissage, defined as a woven mix of cultural thinking. This bit of information is going to help me simplify my answer and help others understand what kind of art I do. What about you? What kind of art do you do? I've always had a studio space at home, whether it was part of a kitchen table, a spare bedroom or a renovated area in the basement. Now, for the first time I have moved my studio practice to a commercial storefront in downtown Prince George. The level of activity past my window each day is fascinating as I watch a community of shop owners and their patrons go about their activities. This move has given me more confidence and commitment to work each day. I still have my day job, but the studio calls to me more often now than it has in the past. Cowboys & Indians Research Project: 1920's silent film,"Daughter of Dawn"
As part of my ongoing research into cowboy and indian pop culture for my Canada Council Grant, I watched this show with great interest. It had an all Native cast along with some amazingly well trained horses. I was very impressed with the riding - especially the scene where they do the buffalo chase on horseback with each rider using only a blanket and a 'thong' bit made from braided leather or deer hide for tack. I paid particular attention to the clothing and personal objects. Although it seemed to me that there were a lot of headdresses in each scene, there were also interesting pipes, spears and tomahawks that appeared to be authentic. In one scene where 'Red Wing' enters her teepee to cry there is an amazing backrest partially covered in buffalo hide. According to Wikipedia - each actor wore their own clothes and brought their own belongings, including tepees. For a time this movie was only rumoured to exist until it surfaced via a private investigator who had been paid for a job with the film. The US National Film Registry has since designated 'Daughter of Dawn' as historically significant and you can now watch the restored film on Netflix. This spring I received a Canada Council grant to research (and create) a new body of work. I am using my art practice to look into how much 1950's - '70's Cowboy and Indian pop culture has shaped my idea of myself as a Métis person. I expect this project to be as much fun as it is revealing. I have begun recreating some of the lifestyle I had as a kid which centred around horses. The idea is to immerse myself in the stereotype as I imagined it to be and create art from that position. 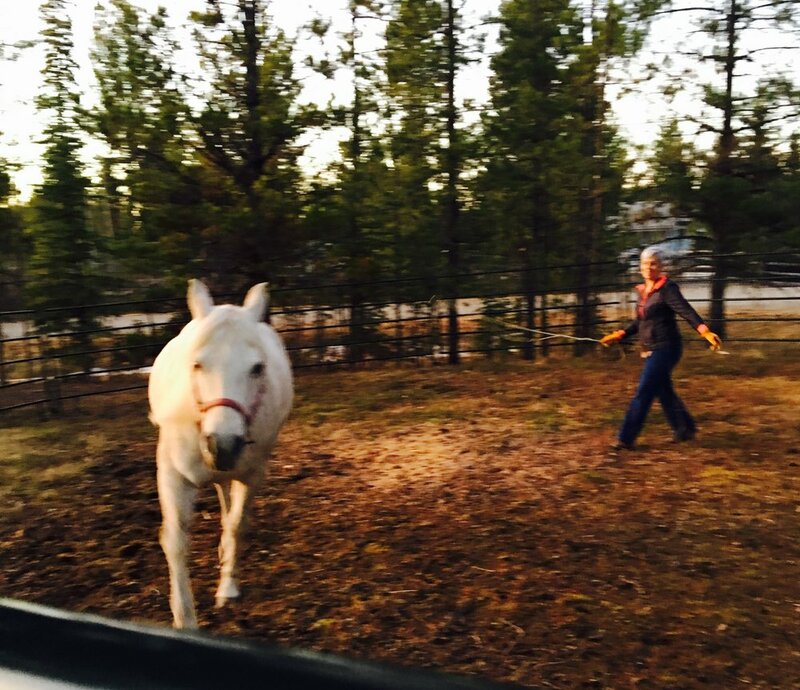 This is Monday, the horse I have chosen to be my companion through this research.In the second photo we are working in the round pen. I want Monday to accept me as the leader of our 'herd of two' and the round pen helps with that. I will be posting regular updates on our progress and the art that comes from my work with Monday. A happy memory that really stands out for me as a teen was a project that my mom and I worked on together. We decided to create a parade costume for my horse. That project expanded into 2 parade costumes and many, many nights of hard work. I loved riding with the costumes and the horse enjoyed it too. However, every year she had a young foal so you can see in these photos that she was often looking off in the distance, trying to get a glimpse of her baby. Now that I have horses again, I think about the possibility of making another costume and, perhaps, my daughter would like to be a part of that too. Who doesn't love a birthday! It is my nephew's birthday today! He is a gregarious 6 year old guy with playful eyes and a head full of ideas. He has an equally awesome older brother. It would appear that they put as much work into their creativity as they do into wrestling with each other. Good to see that they are not too wrapped up in popular media to see the world around them and represent it in their art. There is something so wholesome about kid art. 1) appreciating the labour that goes into making an object 2) realizing the consequences of our purchase on the earth 3) treating the object responsibly, ie: repairing it when it is broken rather than just buying another one. I believe when we are removed from the labour of making an object, we are not aware of its true cost as retail cost is only represented in dollar signs and numbers and not in the process of making. Forgotten are the physical pain, process and sacrifice required for us to 'have' that object. We also don't associate the finished product with its origin. Some things should not be made from the materials that they are, materials and processes that hurt our environment and our people. Finding our way back to living with a smaller footprint will take practice and sacrifice, but it will be well worth it. Take an object in your house and collage a 'this = that' photo. I guarantee it will be interesting. Spring - the way I see it. Tomorrow is my last day in residency. It seemed to move so quickly and yet I miss my family. I feel that I have experienced each day to the fullest here at the Banff Centre. I attended music performances, artist talks, networked, and created. Below is today's work - devising a way for the pages of my 'testament' to link together. Tomorrow I will say goodbye to this space only as I bring my work home.